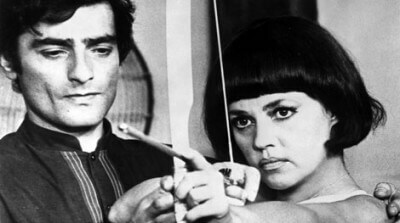 The Bride Wore Black (1968) is the sixth film directed by François Truffaut. By this point, he had already gone from being Paris’ most influential film critic to being one of international cinema’s most exciting young directors, thanks to The 400 Blows (1959) and Jules and Jim (1962). It’d be safe to guess he learned quite a bit during that time, but likely the one thing that most influenced this movie was a book he published just a year earlier: “Hitchcock/Truffaut,” a massive undertaking of film scholarship culled from hours of recorded conversations between the Frenchman and the master of suspense. Adapted from a novel by Cornell Woolrich (who also wrote the short story that inspired Hitch’s Rear Window), Bride follows Julie Kohler (Jeanne Moreau), a woman who remains shrouded in mystery, even as her story unravels, and despite the fact that she’s the cold, hard center of the whole thing. For reasons the film reveals soon enough, Kohler is traveling around France—elegantly dressed, of course—with a list of five names: five men to be exterminated. Stylistically, this is no more of a Hitchcock homage than any other title in Truffaut’s filmography, the entirety of which owes quite a bit to the director of Vertigo. What really makes this movie feel like a Hitch descendant is the frantic, glamorous score by Bernard Hermann, and the way it meticulously presents us with a bunch of charmingly detestable (and therefore doomed) types of men. The self-loathing bachelor who wastes away in solitude, dreaming of the ideal woman (Michel Bouquet); the father and husband with the entitled arrogance of a career politician (Michael Lonsdale, who reveals that he is, in fact, about to run for office); a pair of lady killers who justify their trifling with a thin philosophical sense (Clause Rich and Charles Denner). And then there’s Moreau’s vengeful bride, who hunts and kills joylessly but with complete conviction. There are a few moments where one could almost say she kills mercifully, particularly when Bouquet’s Msr. Coral lies poisoned, taking his last breaths, and Julie waits by his side, still cold but strangely compassionate. There’s very little we’re able to know about Julie, but one thing is clear: for her, revenge is a duty and not a choice. Bride made money in its day and was even nominated for a Golden Globe. But Truffaut, never entirely satisfied with it, would go on to distance himself from it. Which may have a bit to do with its somewhat obscure status, even as it lies within the filmography of such a titanic figure. Bride may indeed be minor, but the good news is it’s also severely underrated: these are stylish psychological thrills of a high order. And its hard enough to find on DVD these days, let alone in a newly restored 35mm print like the one Film Streams will be playing for the next week. The Bride Wore Black is playing at Film Streams, 1340 Mike Fahey St through Thursday, March 15th. Check filmstreams.org for tickets and showtimes.